One good thing about having a well stocked pantry is that it’s easy to whip up treats for your loved ones without making a run to the store. Before I continue though, I have to confess something. I love jelly beans. Jelly Belly beans are my favorite, and I almost always have some around the house. It makes my husband crazy because he doesn’t understand why I buy jelly beans when Easter is no where in sight. The truth is that I have a Jelly Belly addiction. Now that I’ve addressed that issue, I’m ready to move forward with this week’s recipe. This week, I am going to share with you a super cute, fast, and easy no-bake recipe to whip up some Easter treats for the special people in your lives. If you don’t have a Jelly Belly stash in your house like I do, don’t worry. There are always inexpensive bags of jelly beans to be had in the local stores this time of year. You can usually pick one up for under a dollar. My daughter actually thinks these treats taste better when they’re made with “regular” jelly beans. I’ll let you decide for yourself which type of jelly bean you prefer. 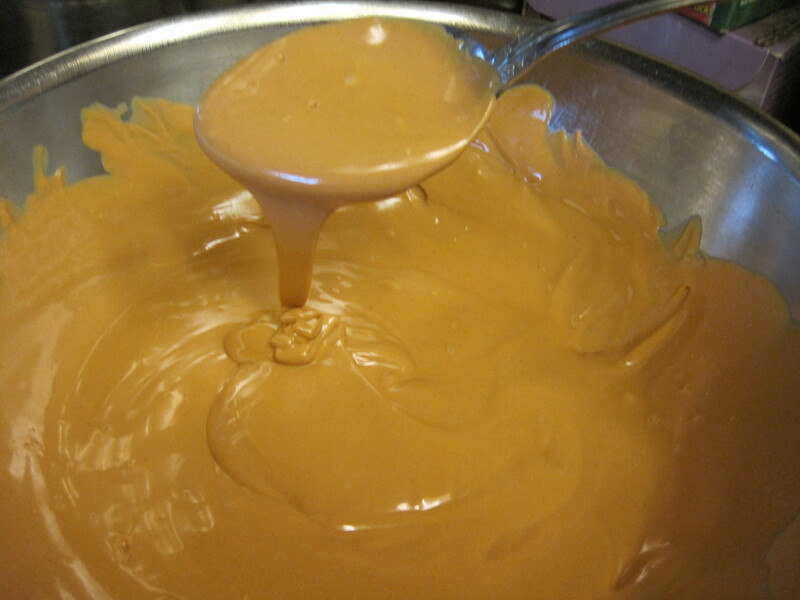 To make the Easter Egg Bird’s Nests, you will need to combine 1/4 cup peanut butter and a 12 oz package of butterscotch chips in a double boiler. 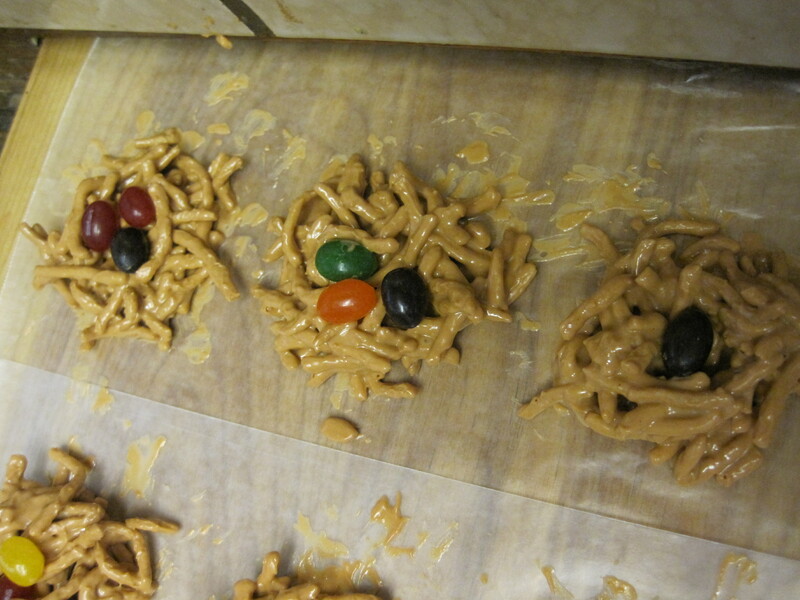 These can also be made with chocolate chips, but the nests would dark brown in color. Stir them until the chips are melted and the mixture has achieved a smooth and even consistency. Add a 9 oz. 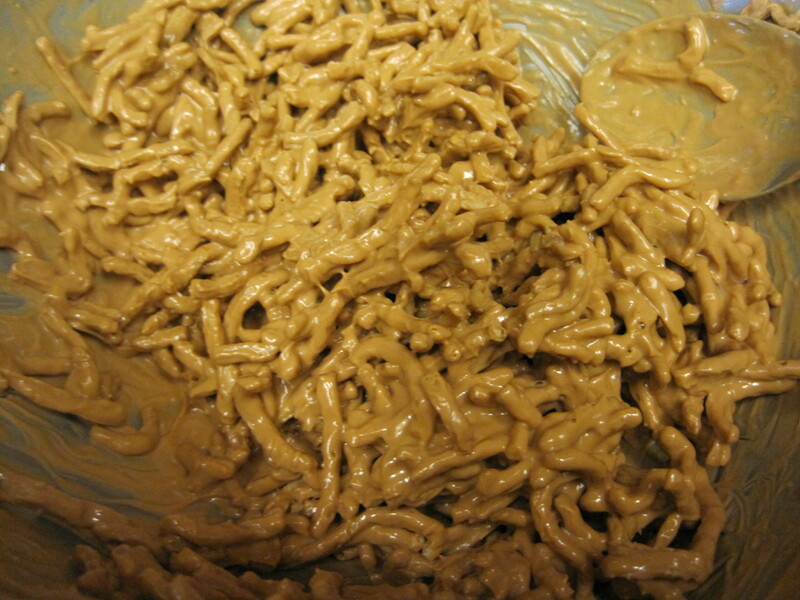 package of baked or fried chow mein noodles and mix well until all of the noodles are coated. These are the crispy noodles that you can eat straight from the bag that are used to top chow mein dishes. When I was little, my big brother used to tell me they were french fried earthworms. That was his strategy to ensure he would have more of them. 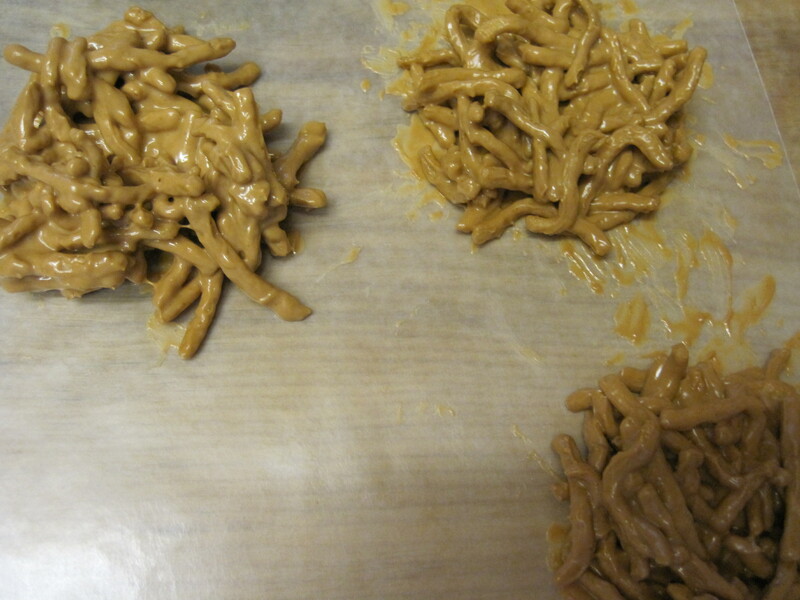 Spoon the noodle and butterscotch-peanut butter mixture onto wax paper and use the spoon (or your fingers) to arrange it into a nest shape. 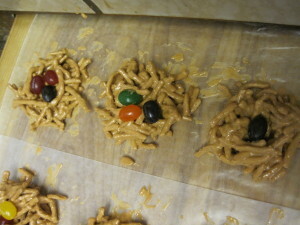 Place 2 – 3 jelly beans onto each nest and place the sheets of nests onto cookie sheets and place in the refrigerator until the butterscotch chips are firmed up. Place in covered container with pieces of wax paper between the layers to prevent sticking. Store in a cool and dry place. For an adult, this recipe goes together quickly. If you have children helping you, add an hour to the prep time so that little hands can work at their own pace. In my household, holiday recipes are all about making memories, so we just allow extra time to enjoy the moment. Thanks for visiting Patty Cake’s Pantry. I hope all of you have a very Happy Easter. A simple 4 ingredient treat that's sure to be a hit with the kids in your family whether they are young or old. 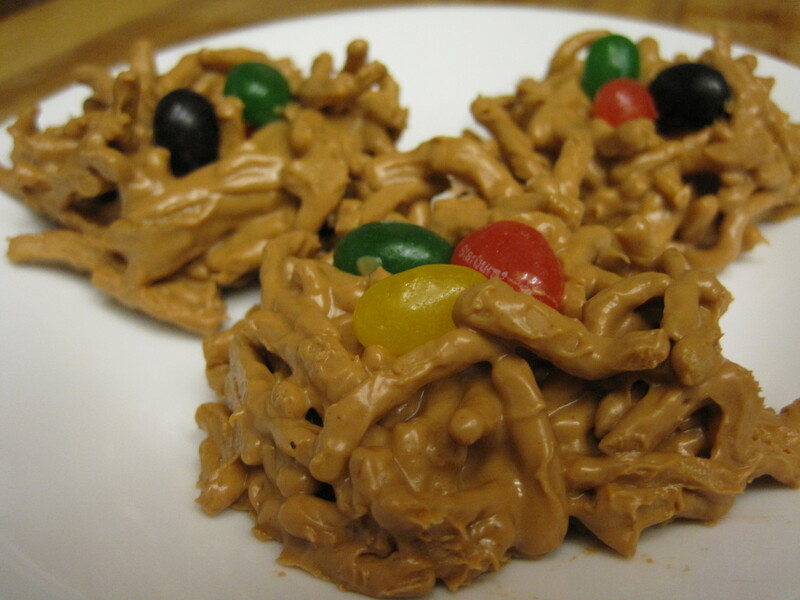 Cook's Note: If you're not a fan of jelly beans, these nests can be made by substituting small candy coated chocolate eggs. Total cost of recipe is $6.98 or about $0.59 per nest when prepared as written. 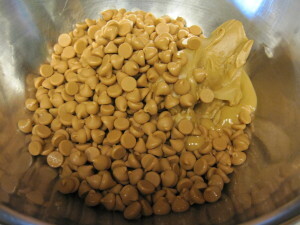 Melt peanut butter and butterscotch chips in a double boiler until a smooth and even consistency is achieved. 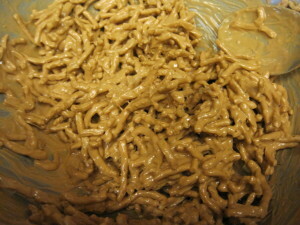 Add chow mein noodles, stirring until all noodles are coated with butterscotch/peanut butter mixture. Spoon onto wax paper making small nests. Use the spoon, or your fingers, to shape them into a round shape and make a slight depression in the center of each one. Place in refrigerator or other cool place until they are set. Place in a covered container with wax paper between layers to prevent sticking. This post was updated March 2018 to include pricing and nutrition information. 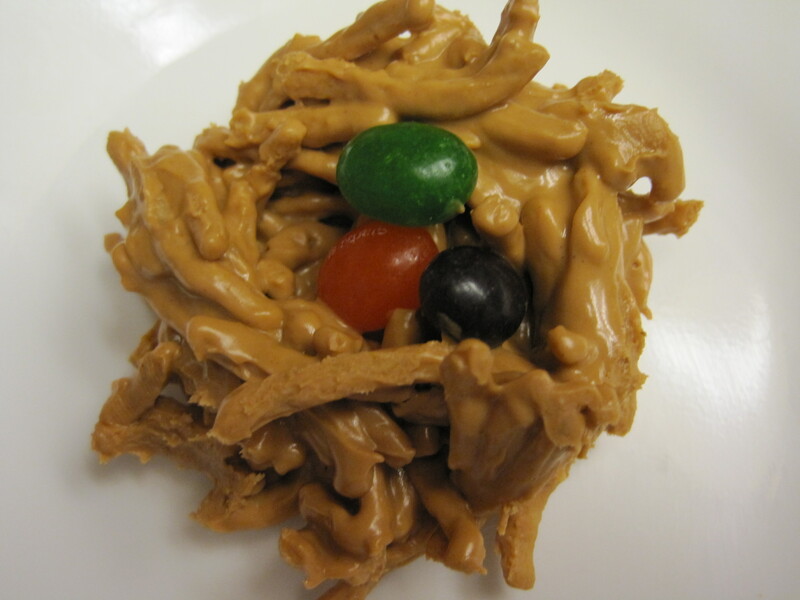 Nutrition information is for one No-Bake Easter Nest or 1/12th of the recipe prepared as above and topped with 3 jelly beans. Thanks so much for visiting my site. During the summer, when it’s too hot to turn on the oven, no bake cookies like these nests are one of the few sweets my kids get. Thank you Nagi. I appreciate you stopping by to comment. I apologize for not responding sooner. I need to go back to your site. There were so many delicious recipes that I have to try.